Bridge of Allan Golf Club Junior Open Success! 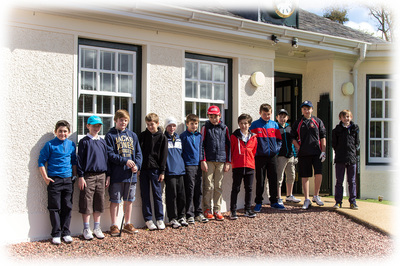 14 juniors competed in Bridge of Allan Golf Club's Junior Open, which was sponsored by Zanart Ltd. Congratulations to Gregor Johnston (from Dunblane New Golf Club) who won the Gordon Niven Trophy for the best scratch score of 77; Scott Hasell (from Dunblane also) was the scratch runner up with a score of 82. 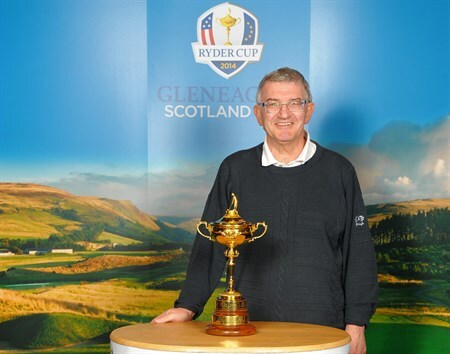 Thomas Preston (from Stirling Golf Club) won the McCallum Cup for the best handicap score of 86 - 21 = 65. 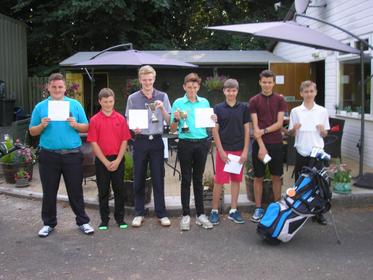 Cameron Taylor (from Bridge of Allan Golf Club) was the runner up with 94 - 26 = 68. Three players tied for the third handicap position - Lewis Cowie (Bridge of Allan Golf Club) with 92 -23 = 69; Andrew Stuart (Bridge of Allan Golf Club) with 86 - 17 = 69; and Jack Steadman (from Callander Golf Club) with 85 - 16 = 69. 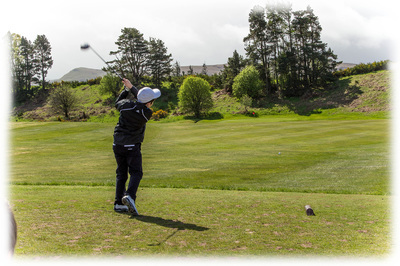 The other scores were as follows: Luke Volland (Muckhart Golf Club) 92 - 20 = 72, Blair Frail (Callander Golf Club) 96 -22 = 74; Aaron Isaacs (Callander Golf Club) 100 -26 =74; Ross Ronald (Killin Golf Club) 103 -26 = 77; Toby Mooney (Bridge of Allan Golf Club) 106 -21 = 85; Lachie Fingland (Callander Golf Club) 109 -24 = 85; Raymond Aimer (Bridge of Allan Golf Club) 114 - 28 = 86. Congratulations all on a great event! Get involved this weekend with Bridge of Allan Golf Club who are celebrating the Open Championship with HSBC Hour. ​HSBC hour is a national programme which encourages people to take up and enjoy the game of golf as interest peaks around major tournaments such as the Open. 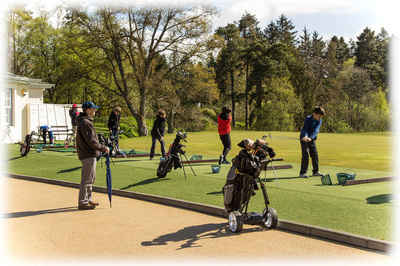 ​Bridge of Allan Golf Club are opening up their practice facilities for children and families to attend a one hour coaching session. This will be on Sunday 10th July, 3pm - 4pm. Contact 01786 831640 for more details. ​The club have also received a new Family Equipment Pack from HSBC all available to use on the day - so get involved in what will be a great day! 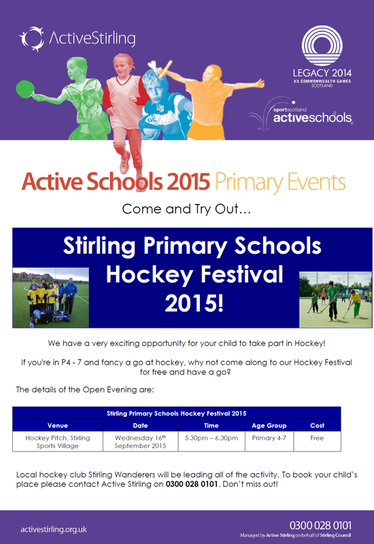 Hockey this summer with Stirling Wanderers! Anyone fancy some hockey this summer? 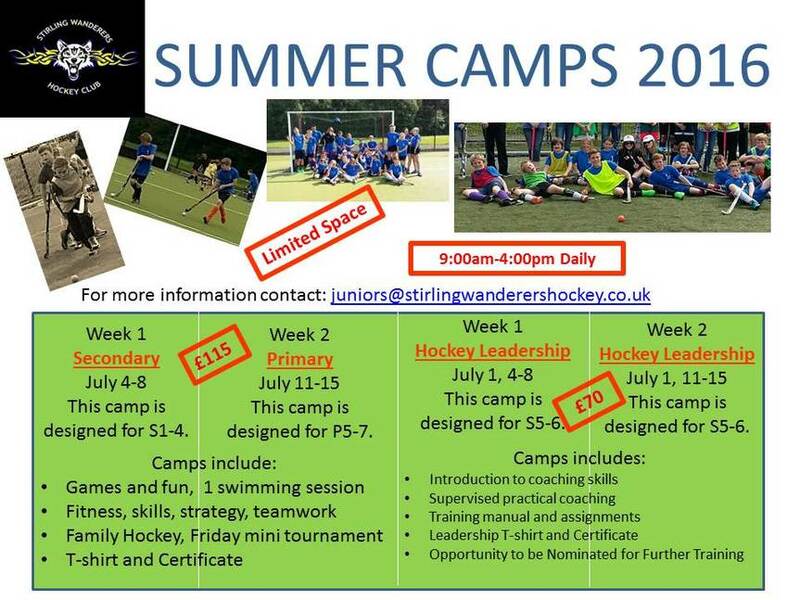 Stirling Wanderers Hockey Club are hosting Summer Camps for primary & secondary school kids. 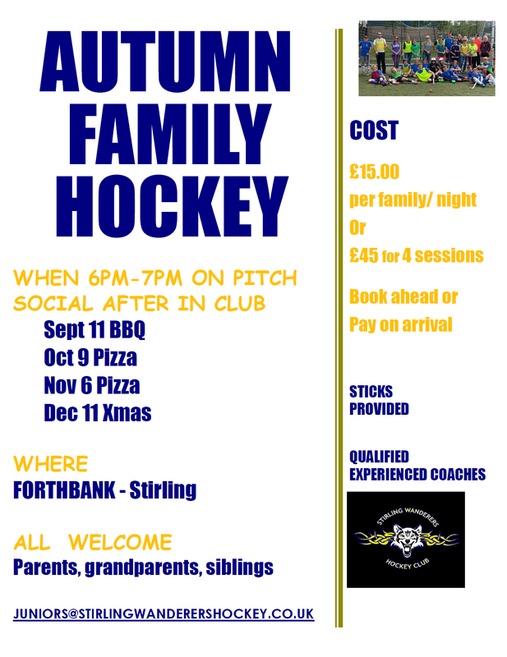 As well as this they're also a hockey leadership camp for young adults in S5-6 - something great for their CV! See poster for contact details. Get involved - limited spaces available. Netball Coaches Wanted for Stirling Netball Club!Stirling Netball Club run junior and adult teams in Stirlingshire. The junior club section is rapidly expandi...ng and the club are in need of enthusiastic volunteers so more juniors in Stirlingshire can play netball. The club need coaches for their class in Callander Leisure Centre, but are also looking to expand in other areas of Stirlingshire too. 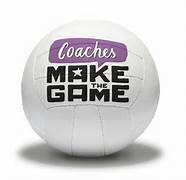 If you have played netball and wish to share your love of the game, or are interested in sports or junior coaching the club would love to hear from you. Experience is not necessary, training can be provided. Contact stirlingnetballclub@gmail.com. ​Chimera Martial Arts are launching a brand new Kickboxing class this Wednesday 20th April! The class is for adults aged 16+ and will be delivered by their brand new coach Scott McKay. The class will be every Wednesday, 8pm - 9pm at MXP Fitness Training Centre. First 2 classes are completely free of charge! Get in touch with Colin Lyon on colinlyontkd@hotmail.co.uk if you're interested in heading along. Forthside Junior Badminton Club are launching their brand new 'Forth Valley Junior Badminton League' which is starting on Sunday 24th April. The league is an opportunity for young kids who like playing badminton & fancy having a go at a few competitive games. They don't need to be a member of a club, and the league will welcome anyone of any ability! 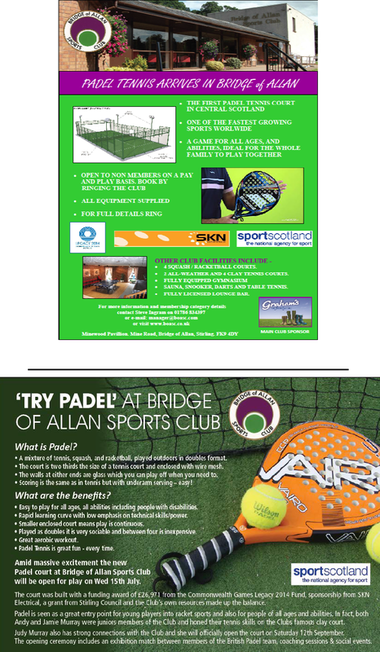 This will be a really great experience and a great step forward for badminton in the Stirling area. The entry cost is only £5 per player. 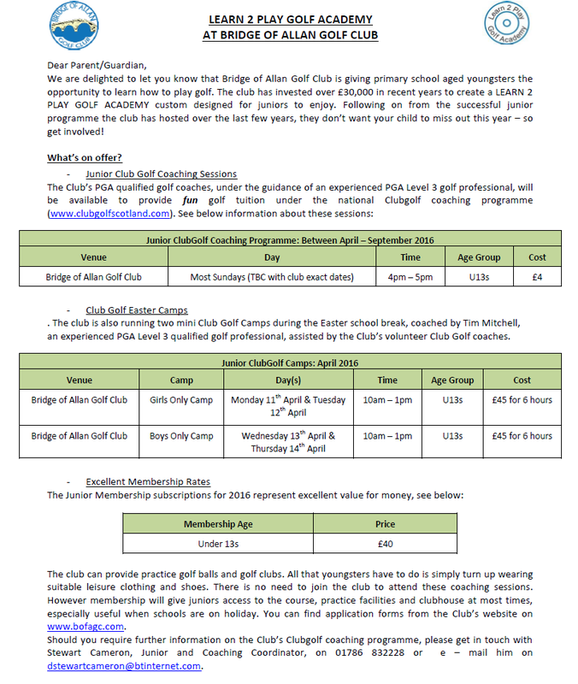 For more details click on the entry form below or e-mail the club on forthsidejuniorsquad@gmail.com. Stirling Knights Basketball Club are starting up a brand new basketball class. 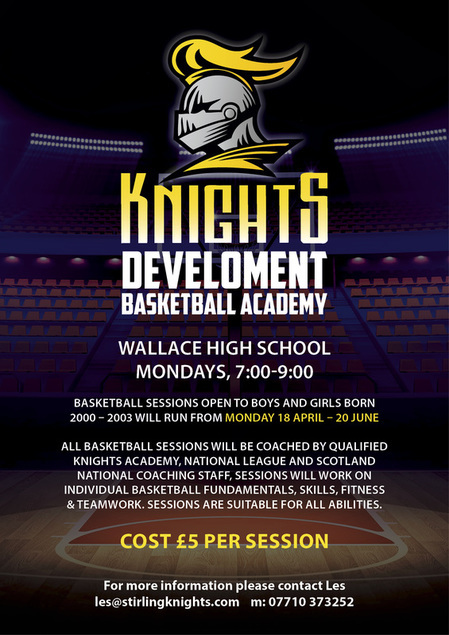 The Development Basketball Academy will be starting on Monday 18th April at Wallace High School. This session is open to any boys or girls born in 2000 - 2003 who looking to work on individual basketball fundamentals, skills, fitness & teamwork. This is suitable for all abilities with a view of joining the club. This is a great opportunity for anyone looking for a trail in the Knights Basketball Academy at U14 and U16 level. If you want to get involved please contact Les on 07710 373252 for your note of interest in attending. 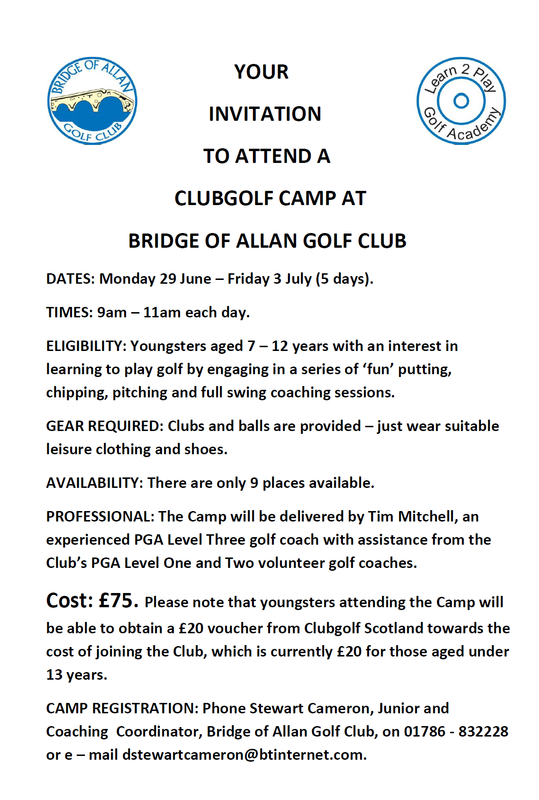 Bridge of Allan Golf Club have a brilliant opportunity for primary school aged children to learn golf! 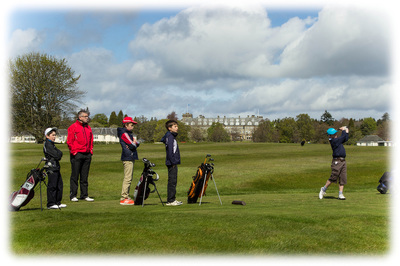 The team at club, under the guidance of experienced PGA level 3 golf professional Tim Mitchell, will be hosting weekly coaching sessions, Easter Club Golf Camps & low membership rates! For more information, get in touch with Stewart Cameron, Junior and Coaching Co-ordinator, on 01786 832228. 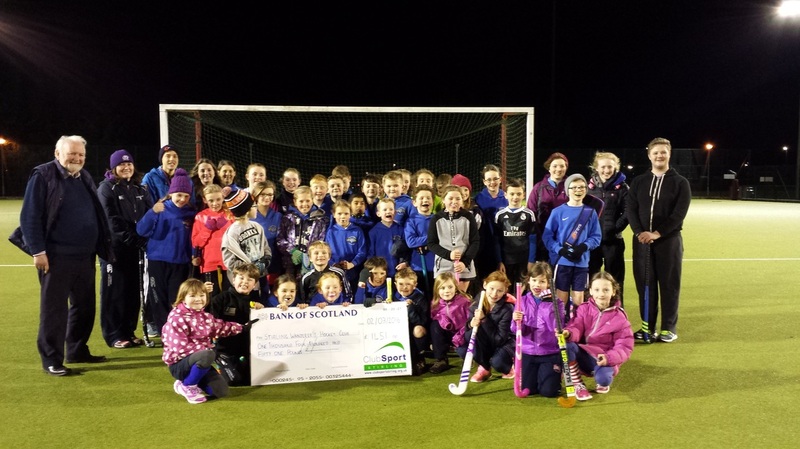 Stirling Wanderers score big with Funding! 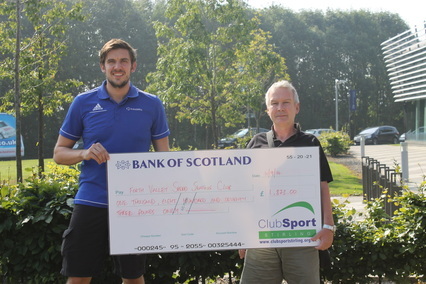 A very big well done to Stirling Wanderers Hockey Club who secured £1451.88 funding from ClubSport Stirling. £776.88 was part of their Club Development application, which they will put towards a range of new equipment to develop their junior section. The equipment will mainly be used around local primary schools to host taster sessions, but also more advanced equipment will be used to progress current junior members to develop their safety and provision at hockey training (i.e. hockey masks / gloves / protective gear). 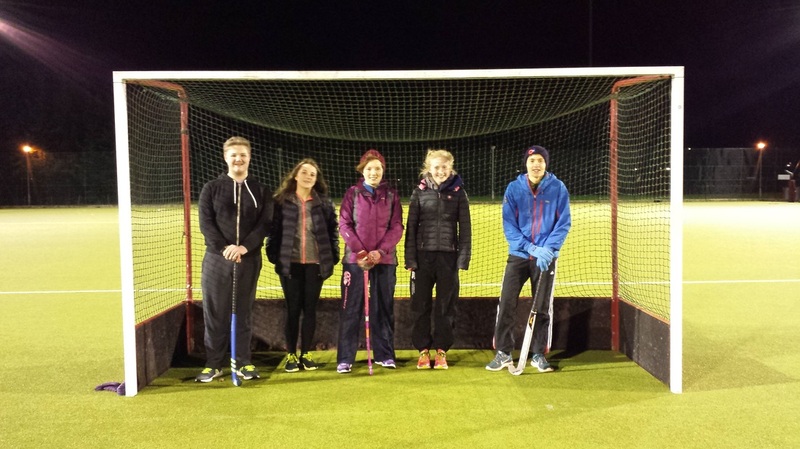 £675 went towards coach scholarship funding for a group of club coaches who recently attended their UKCC Level 1 Hockey course. Well done to everyone involved, especially Colleen Swagger who organised the entire application. 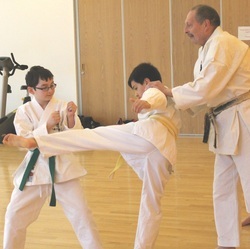 Try Shotokan Karate with Stirling Karate Club! Stirling Karate Club are looking for new members! If you fancy trying out a Martial Art and like the idea of Karate - why not give it a go with Stirling Karate Club. Stirling Karate Club generously give a FREE FIRST LESSON for anyone coming along for the first time, and have extremely experienced instructors in Mike Bissett (6th Dan) and Craig Russell (2nd Dan). The club train on Wednesday evenings 7pm - 8.30pm at The PEAK in Studio 3. Classes are for adults and children (over 8 years old). For more information please phone 07703 207026 or e-mail russellc_6@hotmail.com. 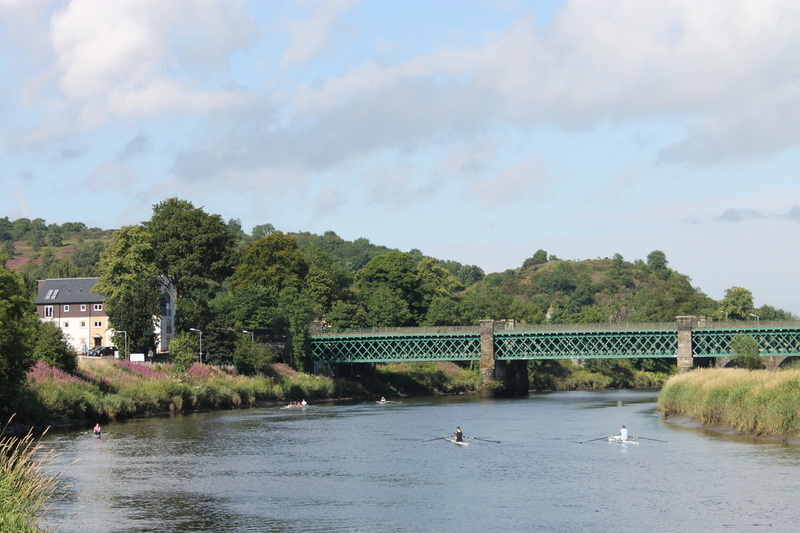 season a Quadrathlon (Combined Event) competition will take place on Sunday 24th January with 90 young athletes signed up to compete. Pictured along with Active Stirling's Athletics Development Officer, Alison Grey and Club Coaches are some of the young athletes who will be taking part in the Quadrathlon. A special thank you to Adam Brown (Head Tennis Coach at Bridge of Allan Sports Club) who hosted the Finals Day today at the Peak. The winning school was Dunblane Primary School, with Harry Sturrock, Calum Gemmel, Carys Gibb, Lachlan Hunter, Megan Hogg and Marcus Sinclair. Bridge of Allan Primary School were very close runners up with Toby Geyer, Dylan Clark, Eoin O'Cinneide, Rosie Woodward, Ava-Mae Conroy, and Cara Birrell. Ken Lewandowski, Active Stirling chair of the board, helped to present certificates and medals to the participants. 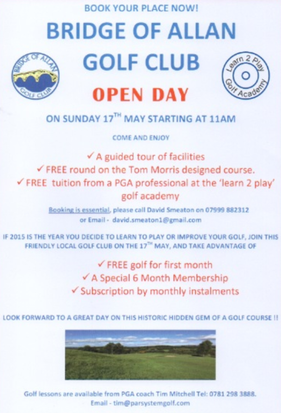 For anyone interested in playing golf, make sure to get along to Bridge of Allan Golf Club's Open Day on Sunday 17th May at 11am. Come and enjoy a free round of golf on their picturesque course - their PGA golf professional Tim Mitchell will also be there to give some free tuition! The club have some special offers for new club members available for anyone interested to join. Very exciting news for any keen netballers in Stirling! Stirling Netball Club will be starting up in April 2015. They are looking for brand new members to join - anyone is welcome from complete beginners to budding league players. The first session is on Wednesday 22nd April, 9pm-10pm, at the Peak. Your first session is completely free! Stirling Spiders Funding sees them hit the heights in Glen Nevis! Check out the article below to see how ClubSport Stirling's funding helped young climbers from Stirling Spiders experience new challenges in Glen Nevis. 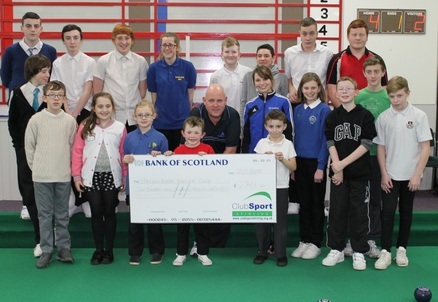 Forth Valley Speed Skating Club secured £1873 from ClubSport Stirling for new beginner speed skating equipment and coach education. This grant money will be used to buy new boots, blades, helmets, guards and gloves. This equipment will be available to those new to the sport. The club will also be sending 6 new volunteer coaches on a NISA level 1 coaching course to help cater for the increased demand for Speed Skating following the Winter Olympics in Sochi where club member Elise Christie competed. Speed skating is the fastest self-propelled sport in the world. If you are interested in trying speed skating please contact Brian Reid on brianreid@freeuk.com. 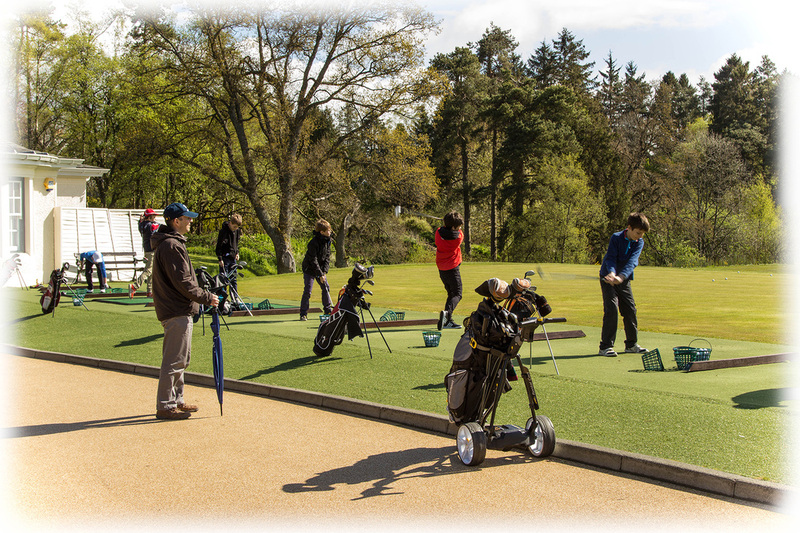 Bridge of Allan Golf Club has been running well attended Clubgolf coaching sessions for local youngsters every Sunday afternoon since April. 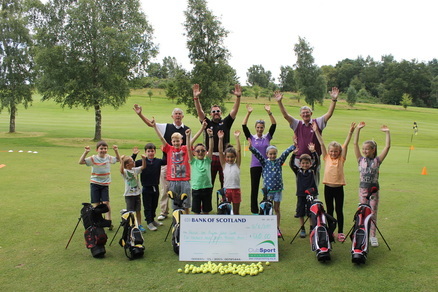 The photo here shows Tim Mitchell, PGA professional and volunteer coaches with a cheerful group of junior golfers, all under 10 years old. On Sunday 17th August, they participated in a sponsored 6 hour putting marathon to raise funds for the Club's Learn 2 Play Golf Academy. 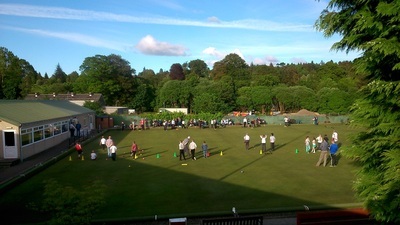 Well done the club and their hard work over the summer towards their growing junior section. 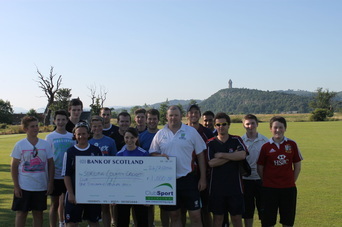 Congratulations to Stirling County Cricket Club who were awarded £1,000 from ClubSport Stirling to go towards their coaching development project. The club have been running a coaching project in partnership with Cricket Scotland to pay UKCC Level 3 performance coaches to come along to the club to mentor and support newly qualified and inexperienced coaches. 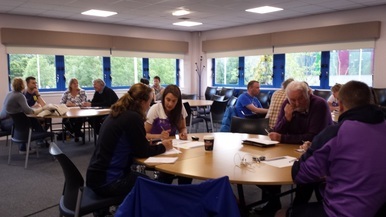 Through a series of workshops and practical demonstrations, the club hope that high level performance coaches can help their coaches to expand and improve their work experience, which will enable their knowledge to be passed onto club members (new and old) and the community of all ages and ability. The project is a great stepping stone for coaches at the club to expand their knowledge and performance of coaching, before potentially progressing to a higher coaching qualification in years to come. 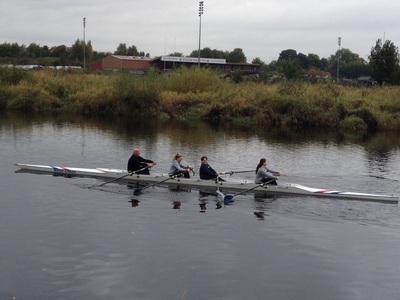 Well done to all involved and we wish them the best of luck! 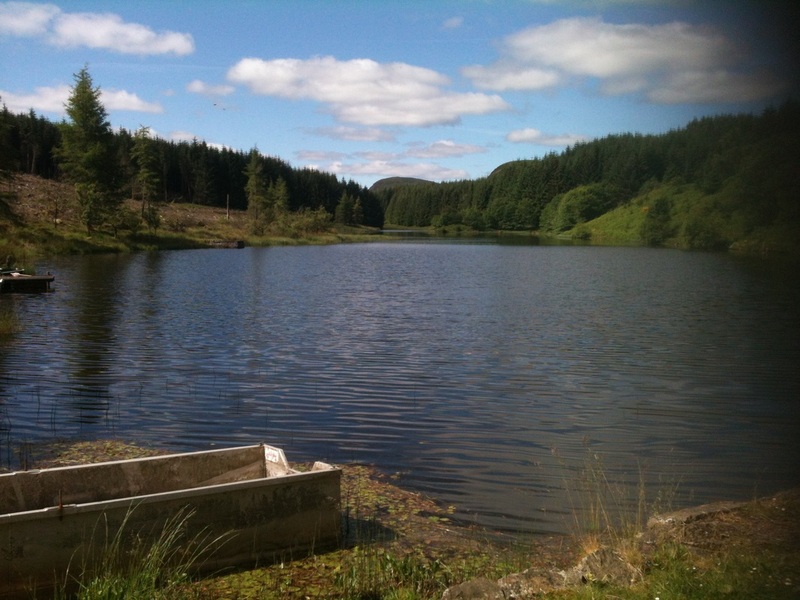 Very well done to Bridge of Allan 76 Angling Club who have been working hard over the last few months to secure funding for their development project on their Loch. 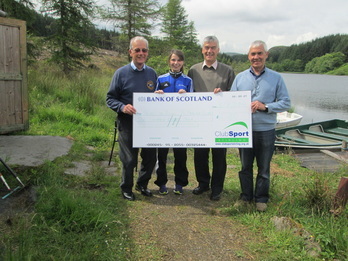 They managed to secure £1,000 funding from ClubSport Stirling and an additional £3,000 from Awards for All to go towards their £7,000 project on their Loch. Click here to see the photo of the club in the funding library. The club deliver many projects and events for disabled anglers, providing wheel chair friendly paths, casting platforms as well as a wheely boat which is specially adapted for the use of wheelchair anglers. 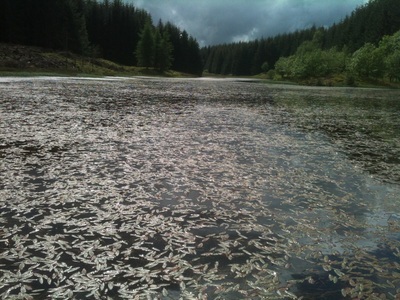 However, their Loch had a very serious increase in weed growth which made almost 95% of the Loch unfishable. 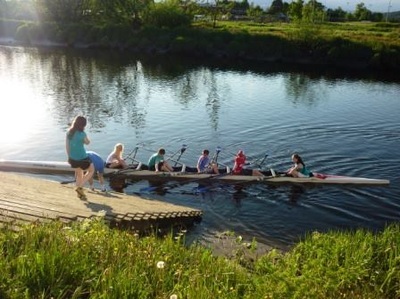 It meant that the club members couldn't use the Loch properly and that disabled anglers were restricted to what they could do. 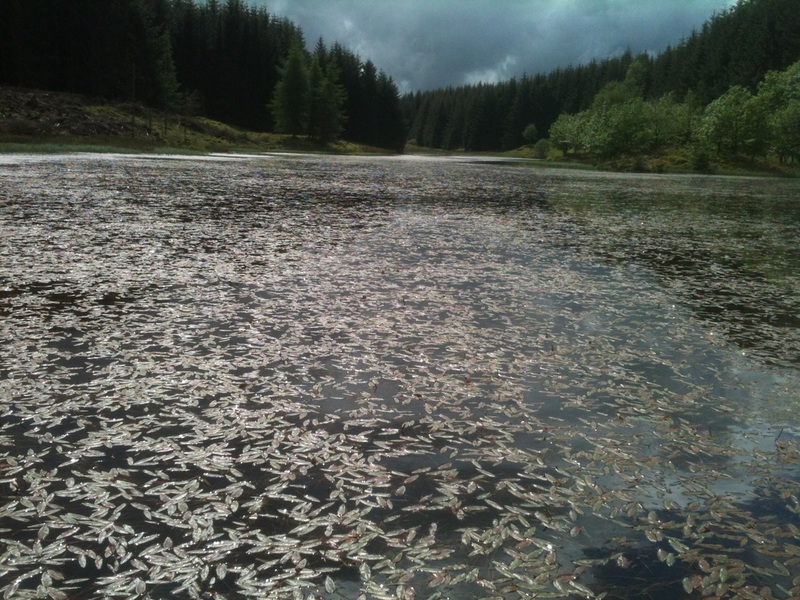 The funding went towards specialised equipment called Truxor to remove weeds on the Loch - which is a unique piece of equipment used by only a few companies in the UK. They are delighted with the project and how the Loch is fishable once again. The pictures below shows the difference that this project has made to the Loch. Remember if your club would like to make a funding bid to ClubSport Stirling please get in touch with your Club Development Officer. 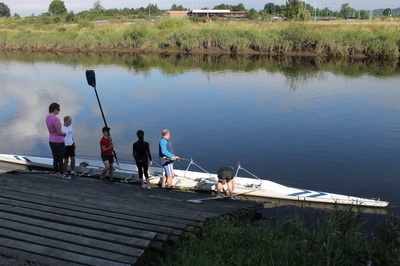 Active Stirling have been welcoming athletes from the Solomon Islands and Pappa New Guinea who are participating in the Commonwealth Games to Stirling this week, who are using facilities in the area as their training camps. Bridge of Allan Judo club welcomed with open arms Tony Lomo of the Solomon Islands, along with his coach Douglas, who is competing in the Men's -60kg category for the Judo in the Commonwealth Games in Glasgow. Tony will be training will the club over the next couple of weeks before he hits the spotlight in Glasgow. Tony and Douglas even helped out with the children's sessions and were a great help on the night with some star stunned kids. We hope that Tony and Douglas enjoy their time with the club and they're stay in Stirling before the Games. 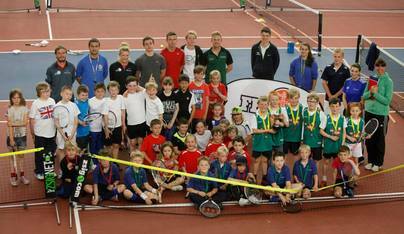 On Tuesday 3rd June 2014, Adam Brown hosted the Primary Schools Tennis Competition - Finals Day. 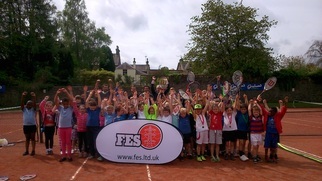 All of the winners from each cluster tournament of Dunblane, Stirling and Wallace came along to the Gannochy Tennis Centre and played some brilliant tennis. Well done to St Mary's Epsicopal Primary School in Dunblane who won the competition overall, with Beaconhurst School as runners up. Thanks once again to Adam Brown and his coaching team for hosting a brilliant event, and the staff at the University for allowing us to use the facility last minute (unfortunately we can't control the rain!). Well done to all the schools! A massive well done and thank you to Fiona Bennie (Dunblane Sports Club) and Adam Brown (Head Coach at Stirling Lawn Tennis Club and Bridge of Allan Tennis Club) for organising and hosting the cluster tournaments for our (first ever!) 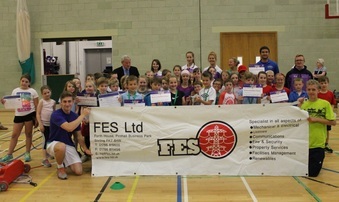 Stirling Primary School Tennis Competition. The Competition has been extremely popular within the primary schools involved, with those in the Dunblane, Stirling and Wallace clusters, and we hope we can continue it every year with more primary schools from other clusters. Congratulations to the winning school teams: Dunblane Primary School; St Mary's Primary School (Dunblane); Cambusbarron Primary School (A Team); Cambusbarron Primary School (B Team); Cornton Primary School; and Beaconhurst School. These teams are now through to the 'Finals Day' on Tuesday 3rd June, at the Peak. Well done and a good job to Bridge of Allan Golf Club who volunteered their time this morning to host Riverside Primary School at the University Golf course for their Schools Golf Festival. The Golf Festival has been set up by the club to give P5 pupils the chance to try out and have a taste of golf. 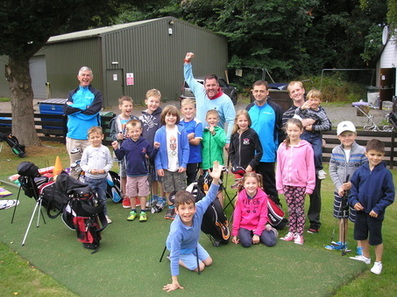 The club brought along their very own PGA professional golf coach, Tim Mitchell, who set up all the activities on the day. Alongside Riverside Primary School, they are also hosting Cornton and Bridge of Allan Primary Schools later on this week. If you fancy a taste of golf and getting involved, contact Stewart Cameron on 01786 832228 or email him on dstewartcameron@btinternet.com. Stirling Karate Club have launched a brand new karate coaching session. 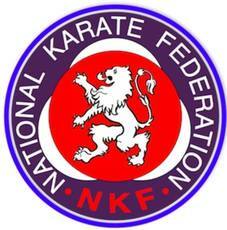 It’s an introduction to karate session for children and adults aged 7+ years. £6 per week for both classes for both parent and child! For more information and to get involved, contact Michael on Michael.aitchison@prudential.co.uk or phone 07769 958662. A big thanks to Bridge of Allan Judo Club who came along to the Peak on Sunday to host Judo for the Active School's 2014 Legacy Programme for the Commonwealth Games. 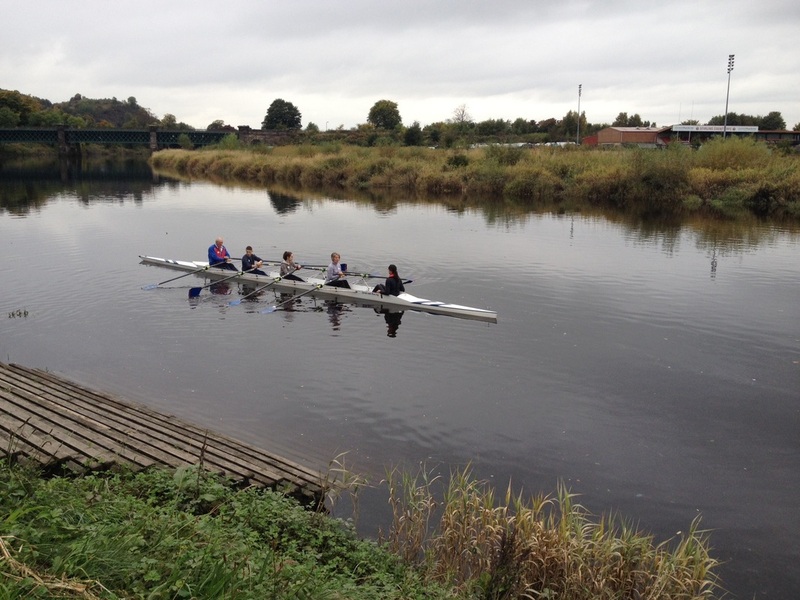 The club volunteered their time to over 25 school children from Stirling to learn the Commonwealth sport. 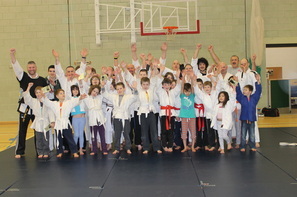 It was a great success with children smiling throughout the whole event and desperate to continue with Judo. Club coach, Kevin Douglas, said "even if this event manages to get one more child actively involved in Judo, it has been completely worth while." 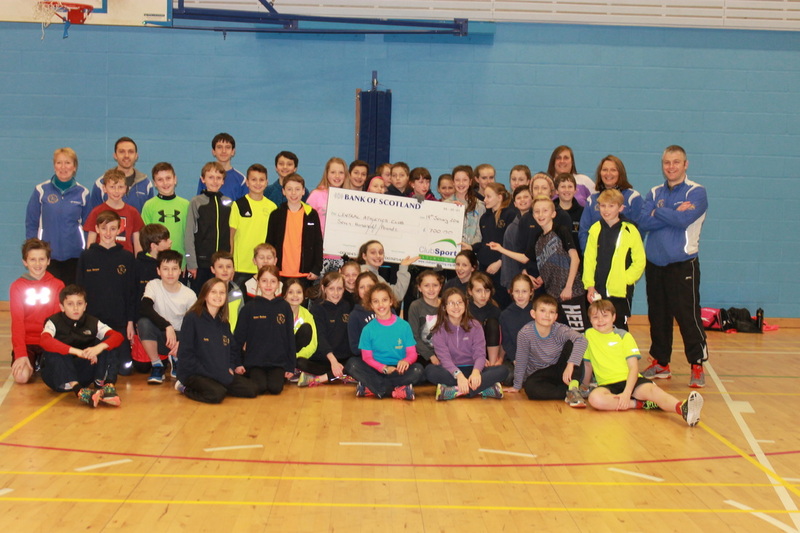 Active Stirling's Club Development Officer for the Wallace Cluster, Ruth Henderson, said "this programme has allowed children to interact with Commonwealth sports in the lead up to the games in 2014. 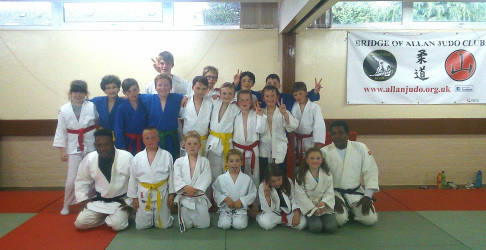 Many children at the end of the event couldn't wait to take up Judo. That is what it's all about."